Are These Guys Gorgeous Or What? Talk about surprises. Look who came strutting down my driveway the other day. Bear and I had just finished our early afternoon sheep check and were heading over to see Dan when all three of us heard the chain on the front gate jangling. There was no sound of a vehicle, though. We peered through the trees toward the gate--which is about an eighth of a mile away--trying to figure out what was happening up there. And then something started moving toward us. Bear, Dan, and I must have made an amusing sight as we stood frozen, staring up the driveway. My first thought was, Amish funeral wagon? Here? Why? 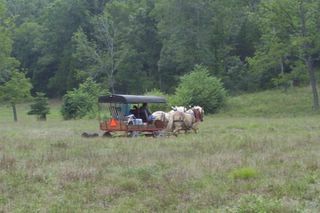 But as it came closer, I realized that the little covered wagon was being driven by our friend Steve. He pulled up next to us and smiled. I was so surprised, I can't remember what I said to him. Probably something along the lines of, "Those horses are enormous!" And they were. Steve said that he was heading to the river to camp for the night and figured he would stop by and show us his latest acquisition. Since they'd just travelled 14 miles from his house, the horses needed shade and water. I suggested we head up to the house, and Steve asked if I wanted to ride. Of course! I shared my half of the bench seat with a charming, black and tan weiner dog named Flash who sniffed my outstretched hand, gave me a smile, and plunked his head down on my leg. Bear, meanwhile, was going a little nuts. He absolutely loves to chase moving vehicles (he runs along trying to bite the tires while barking fiercely at them), and he is crazy about all animals--especially ones that look as if they might need herding. A four-wheeled wagon pulled by two giant horses? He was in heaven. But unlike tires, horses can respond to noisy ankle biters. Bear received a swift little kick for his stockdog efforts that immediately put him in his place--somewhere well below the horses. He was fine, as he comes from long lines of dogs that are used to being trampled. He cheerfully followed us up to the house, where he proceeded to keep a watchful eye on everything from a safe distance. Steve offered us sweet iced tea and thick hunks of homemade cornbread, and then he started talking. Pudding and Butter (named by his daughter) were Belgian draft horses. They were about six years old and full brothers. 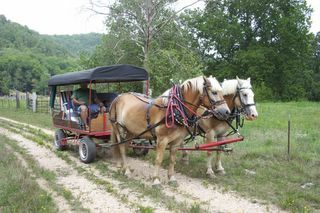 They had just spent a month living with a nearby Amish farmer who trained them to work together with the cart and used them to help harvest his hay crop. They were now back at Steve's farm, where they shared a pasture (but not their daily treats) with his cattle. The horses' beautiful leather harnesses were handmade by a local Amish craftsman. The wagon was custom built in a nearby town and sported everything from four wheel brakes (quite useful on our very steep driveway) to a backboard that folded down into a handy little table. Pudding and Butter rested quietly while Steve told us about all of his plans. These included everything from using his horses to train others ("I can teach Dan to pull a cart!") to leading groups of people on meandering day trips through the countryside. In the meantime, he was clearly having lots of fun. Our surprise visitors stayed just long enough for the horses to catch their breath, and for us to catch up on the latest news. And then, loaded down with homemade peanut butter cookies and a loaf of oatmeal toasting bread, they were off, headed back up the driveway with Bear right on their wheel. What a lovely story! I miss those days of hearing someone at the end of thd driveway...your entries make me miss living in the 'country' more and more! What a treat. Cheers for a lovely start to the day. wow, what an amazing life you have. I also love the way you tell a story! What a wonderful surprise and a wonderful story. You obviously lead a charmed life. My mom's family lives near Amish country in western PA/eastern OH. I haven't visited there in a long time--thanks for the glimpse back! I'd be more than happy to receive surprise guests like that! I am a horsewoman at heart, so this was an especially sweet treat for me. I have always wanted to ride a draft horse, but still haven't had the chance. They are such a blast to drive! Feel all of that power in your two little hands...incredible. Hey - keep us posted on Steve's "Rides Through the Countryside". My sister just moved to Kansas, so when I go visit her, maybe I'd drive over and buy a ticket for a cart-ride with Steve!